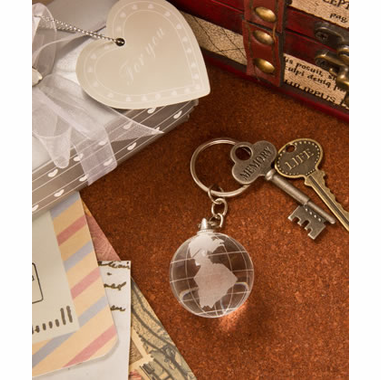 These glass globe keychains are just perfect for graduation giveaways, retirement favors or travel theme parties. 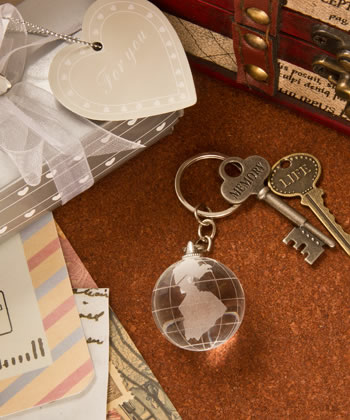 Send your guests home with the message that the world is theirs! Each is a crystal glass globe measuring 1.25" in diameter on a silver tone metal ring and chain approximately 3.25" long. The globe has a frosted map image. Each comes in a 2 pc box and is finished with a white bow and a general use "For You" tag. Sorry, this item is not available to ship to California due to regulations related to Proposition 65. You may also order personalized tags for .35 each. They didn't look this amazing in the picture, but they came in cute little gift boxes and they are heavier than you might think. A wonderful and quality product!